MOST MINNESOTA SCHOOLS remain closed through Wednesday due to extreme cold. Air temps in the minus 30-degree range combined with 30 mph winds could bring windchills of 60 degrees below zero. That’s dangerously cold. Too cold for kids to wait at bus stops or walk to school. Too cold, really, for anyone to be outdoors. Exposed skin can freeze in minutes. We expect schools to close. But how does weather affect the rest of our day-to-day activities here in the Bold North? Afternoon and evening sessions of Bingo at Jackpot Junction is canceled. VFW Post 1215 – Rochester: Hall Bingo for tonight, Jan 28th, is cancelled. And one more thing, if you live in Morton: Residents of Valley Drive and Quarry Drive in Morton should leave water dripping in faucets to avoid frozen pipes. Yup, just one more concern besides frostbite. And no BINGO. BONUS: Click here to read my published poem, Wednesday Night Bingo at the Legion. 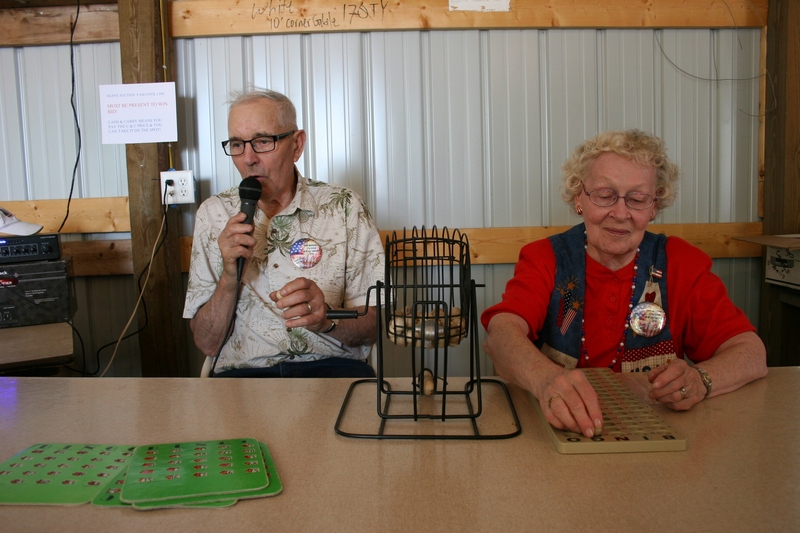 John and Lavonne call bingo at the North Morristown, MN., Fourth of July celebration. This photo won first place in the People Category of the National Mutual Benefit annual photo contest. This image also helped inspire my winning bingo poem. Minnesota Prairie Roots file photo 2013.
that transcends time and generations. a slight elderly man with wisps of fly-away hair. pulls mic to mouth and purses his chapped lips. when nothing seems as blessed as the hope of a win. where service to country rates reverent respect. YOU, TOO, CAN BE A WINNER. Check back on Wednesday for a give-away. Poem reprinted with permission from SELCO (Southeastern Libraries Cooperating), Rochester, MN.